Woodview Home provides compassionate and personal skilled care 24 hours a day. We specialize in providing person-centered care to help our residents maintain their independence and have an active role in their care. 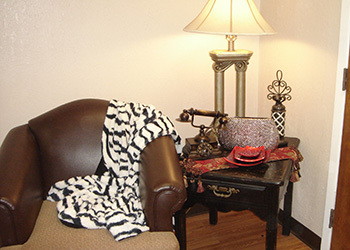 We have created a comfortable environment where our staff and residents feel like a family. Often, the transition to a nursing facility is challenging. At Woodview Home, we strive to ease the process by providing an environment where residents and guests feel informed and comfortable. We are not just a long-term care facility, but also offer short-term skilled nursing and rehabilitation services. A team of qualified professionals helps residents recover from surgery, injury or serious illness. They understand the importance of creating a comfortable and nurturing atmosphere, whether residents stay for short-term treatment or long-term care. Visitors are welcome every day of the week. Come see our residents and friendly staff in action. Please contact us to learn more about the unique, sophisticated healthcare environment at Woodview Home. 68-beds. All beds are Medicare and Medicaid certified.